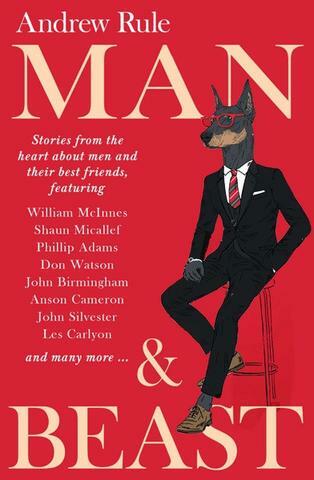 This is an extract from Man & Beast (MUP, RRP $29.99, eBook $13.99), an anthology edited by Andrew Rule, available now from https://www.mup.com.au/items/198605. Indian Head, Fraser Island. 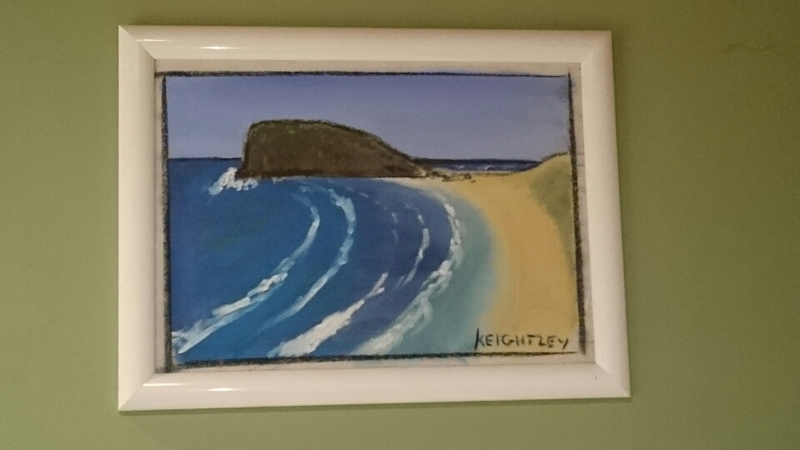 by PJ Keightley The painting on the bathroom wall. I think of Fraser Island every day. True. I am reminded of it each morning by a simple oil painting that hangs on our bathroom wall. Sometimes, when I am riding the kids to get them ready for the day (‘Get your shoes on, have you done your teeth, I’ll get a new toilet roll’), I catch a glimpse of the painting and think of Fraser’s tranquillity, her forget-the-worries-of-the-world isolation, and her beauty. And I think about Acanthopagrus australis. The bream. A sleek silver fish, oval-ish in shape, a little longer than a school ruler, which zips around, here and there, in the gutters along the beaches of most of Australia. The painting is of Indian Head, the rocky outcrop up the northern end of the island, on the eastern side, the first real interruption to a wide Pacific beach that stretches for almost 100 kilometres. It was painted, in his naive style, by a mate of mine, PJ, for many years a Mooloolaba dentist, and still going, whose family have enjoyed Fraser for half a century—from the 1960s, when all you’d find was a handful of laconic fishermen trying to keep their favourite spots secret. I first met PJ when I had just enrolled at uni in Brisbane. He didn’t attend as such, I don’t think, it was more that he hung around. He was from the Sunshine Coast, where he spent a happy boyhood surfing until his father, Paul, the dentist at Nambour, realised his third child could only be saved by the brothers at Nudgee College. Off he trudged. As a boarder, PJ learned rugby and indolence. One of the blessings of varsity and college life is it gives the like-minded a chance to find each other. We were from all over Queensland but each had found our own path to indolence. PJ didn’t live at Union College, with many of us, but he was always at the Rec Club, enjoying the delights of multi-ball pinball (‘Destroy Centaur’), drinking rum and Coke—Bundy, of course—and singing Daddy Cool’s ‘Bom Bom’ with the covers band. He was a good conversationalist with a wealth of experience. He had many theories. He believed a bloke should only own one pair of shoes. He preferred the ripple-soled golf shoes, which he wore to uni balls at Cloudland, at court appearances, to nightclubs (always thongs to the pub), and on the West Course at Indooroopilly. I don’t think I knew PJ was studying dentistry until he offered to make Madge, the toothless barmaid at the Royal Exchange in Toowong, a set of dentures. (‘That’d be bonzer, darl.’) I reckon he was in fourth year. Madge, who’d been around, and who knew your school’s order before you got to the bar, was pleased as punch. I also didn’t know of PJ’s deep affection for Fraser Island. He was one of those students who’d duck off for a surf regularly, but his family often went to Fraser—the whole lot of them besotted by the place—whether the fish were biting or not. They had an old four-wheel drive and they stayed in some ancient shacks. Regulars on a favourite stretch of beach near Yidney Rocks, they became friends with one of the old blokes who lived by himself at Poyungan Rocks, on the beach just to the south.There is very little freehold land on Fraser, but Reg Rabies, a retired cocky from out west, who could have been any age from fifty- six to seventy-eight in that weathered outback Queensland way, actually owned a block. He had no one to pass it on to when he went to God. He wanted the block to go to a family who genuinely loved Fraser, so he did a deal with PJ’s dad: if they kept him in motor vehicles, they would eventually own the title of the land. That was a tougher deal than it first seemed. Fraser is harsh on four-wheel drives. The salt corrodes the metal. But the more immediate danger is the tide. To get around on Fraser, you drive along the beach, which is like the Gold Coast Highway for much of the day, but shrinks to nothing in many places at high tide. You can get caught. Many a proud (but inexperienced) owner has watched as their Jeep or Toyota has been sucked into the ocean by the surf. It is embarrassing, and expensive. Rule one at Fraser: know the tide times. Old mate was a little careless with cars, and after a number were caught in the waves and last seen heading for New Caledonia, PJ’s dad suggested a different arrangement. Rather than keep him in cars, they kept him in beer and looked after his medical prescriptions. Eventually the poor old bugger died. His block was right on the beach. PJ’s family built a simple, functional two-level shack with a couple of bedrooms—one with a double bed and one with about ten bunk beds in it. The upper level has a balcony, which looks out across the magnificent Pacific Ocean. I didn’t know about Poyungan in those days. PJ went to London and played up like a second-hand Victa, but returned a very capable dentist. The transition amazed most of us. We were battling away ourselves but, by the mid 1990s, most of us had taken enough steps along life’s path to be able to organise our own time (with a bit of warning). So, we would respond to PJ’s annual call. He’d nominate the week, put together the touring party, and off we’d go. A party of old uni mates is a good (and dangerous) thing. We’d come from all over and meet at PJ’s in Maroochydore. A couple of four-wheel drives would be stacked with the essentials—fish- ing gear, and enough supplies to cater for our rehydration—and off we’d go. It was all about the fishing. (Really?) Fraser is famous for tailor, a fish that arrives at the island en masse. When they’re running—in late winter—people stand shoulder to shoulder on the beach, reeling them in. We toured in quieter times, times of fewer fish, in search of bream. We’ve always had our spots. Like the wreck of the Maheno, a ship that ran aground on the east side not far from Poyungan in 1935. It has attracted bream and other species ever since. After crossing the Noosa River, we’d head along the mainland beach, past Double Island Point and Rainbow Beach, and on to Inskip Point, where we’d catch the barge to make the short crossing across shallow water to Fraser Island. Then we’d drive along the beach and around the infamous Hook Point, which has caught many an unsuspecting driver. I recall seeing the expansive beach for the first time—wide, on low tide, it went forever. The late-spring light. The heat in the midday sun. The rich blue of the ocean. The huge sky. The white water of the crashing surf. And its sound. The massive dunes of the island, some gouged by the previous high tide, some like waves of perfect sand, some dotted with pandanus and casuarina trees and other vegetation. The beach, so flat, better than any paved city freeway, except for the many little creeks that leave the dunes and drain into the ocean. Fraser Island is a paradise. It is a sand island. The inland lakes—especially Lake McKenzie—have to be seen to be believed. The water is pure, so clean, it’s hard to gauge how deep it is. The stands of giant satinay and scribbly bark, among many other species, make a canopy, and rainforest. Fraser is filled with animal life. It’s nothing to spot a sandy coloured goanna the size of a small crocodile. The bird life is majestic. Sitting at PJ’s, you can watch the brahminy kites arc high into the sky. There are dingoes, and for a long time, there were mobs of brumbies. The tours are always brilliant, but I remember one absolute cracker in the late 1990s. I was struggling (generally) to find the motivation to keep going with postgraduate research. I was sitting in the Fryer Library at the University of Queensland, looking at microfilm of 1930s newspapers, when on the screen appeared a news item about the sinking of the Maheno. ‘Ah, Fraser Island,’ I lamented. The incident became the catalyst to thrust my name before the selector (PJ) for a new tour. That tour proved popular. There was BSN (a sort of forty-something Ferris Bueller), Sheeds (the vet), Big Trev (another dentist), Aldo (the pilot) et al. A fine bunch. It was the tour we had beach sprints, and played some dune golf with royal and ancient sticks; the tour when Rogan Josh won the Melbourne Cup. There was no debate about the day’s schedule. A post-sunrise fish out the front or at the Maheno—for bream—followed by pan-fried bream for brekkie. Maybe an early ale. A rest. A swim, perhaps, to get the hair salty and the skin feeling like you’re on holidays. A drive along the beach to find pipis (Paphies australis)— some for lunch and some for bait. Pipis surface after a wave; the slightly raised wet sand at water’s edge is the indicator. ‘Pipis!’ someone yells, causing PJ to come to a screaming halt—then it’s dig, dig, dig. A heap of pipis in chilli, white wine and lime juice, cooked in the wok over the wood fire in the yard, washed down with a nice Riesling. A little more Riesling. A book and a rest. A game of 500. Dodgy phone coverage and no thought of the internet; a blessing. PJ and BSN sorting out the fishing tackle, and driving up and down the beach in search of the right gutters. Some yabby-pumping and some wriggling in the sand for worms to augment the supply of pipis. Who knows what a bream fancies in the late afternoon. Then three hours of can-in-hand (XXXX, of course) fishing. The bream is the Corolla Seca of fish. It may not be a big fish, and it may not be the most defiant or sporty fish, but it’s playful enough, especially for the once-a-year angler whose eyesight makes baiting a hook a victory in itself. I don’t have PJ’s touch— he’s been known to wade in and grab fish with his hand—or BSN’s determination, but I know how to celebrate when a decent glistening bream is dangling from the line. And when PJ does the honours on the cleaning table at home and he’s preparing the catch for dinner. What follows is always conversation with blokes thinking they’re funnier than they are, the red having performed its duty, until a few Bundies and a game of Rickety Kate fill the room with more laughter. I have many memories of glorious Fraser afternoons when I look to the south or the north and see half a dozen of us spread along a pristine beach, golden sun behind us, favourite old T-shirts hanging over even older shorts, trying to outsmart a bream. These are some of the characters with whom I have lived my life. I just don’t see them often enough. I thank Fraser Island for getting us together. And I thank the humble bream. Every man needs a Fraser Island. Mine’s Portarlington and the Bellarine Peninsula. Fraser Island is a magnificent place. When I went there I thought I’d walked onto a movie set. It is too beautiful to believe that it is just a freak of nature. After reading this I have an urge to go immediately to a beach.